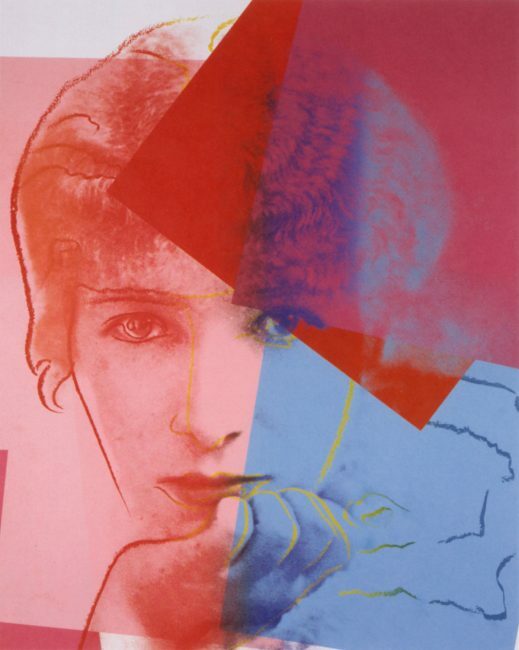 Sarah Bernhardt is from Andy Warhol’s series Ten Portraits of Jews from the 20th Century. The portrait of Sarah Bernhardt, in which her beautiful, ghostly face is layered over a square divided diagonally into blue and orange fields, with a tilting blue square floating in the orange area, is evocatively layered and disjointed. The geometric layering adds a modern touch to the classic beauty. The overall impression of the series, however, is of generic illustration.